There are records of games between semi-organised teams and clubs in the region dating back as early as 1876, however it is not until 1879 do we see a formal club scene. Carterton and Greytown were the first shortly followed by Masterton. Initially the game had a shaky start but by the early 1880′s the game had taken hold in the province and new clubs, like the “Rising Stars” from Greytown and an all Maori club from Masterton called “Te Ore Ore” (today known as Pioneer RFC), were emerging every season. It was during this time that both the Masterton and Greytown clubs had become affiliated to the Wellington Rugby Union; however in 1885 club officials had begun to discuss the formation of a separate Wairarapa Union. The Wairarapa Union was formed after a meeting held at the Marquis of Normanby Hotel in Carterton on the 27th March 1886 at which Mr S.H. Wickerson proposed, “That it is desirable in the interests of football in the district that a Wairarapa Union be formed, and that other clubs in the valley be asked to co-operate”. After being seconded by Mr O’Conner, the motion was discussed and carried. 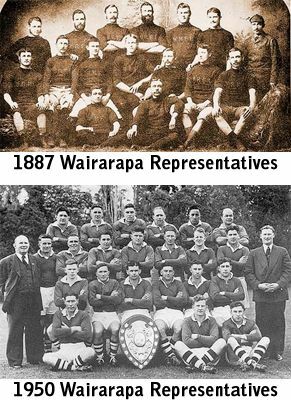 The new Union played its first representative match in 1886 against Wellington, in Wellington, where the home side won 6 points (3 tries) to nil. However in the return match played in Greytown, Wairarapa was victorious 4 points (2 tries) to two (1 try). The first season wound up with a match against a touring side from New South Wales, Wairarapa went down to the narrowest of margins six points to five. Standing: Connolly, CJ Beard, Chas Fairbrother, WE Welch, Edwin Udy, Chas Reid, Mr JW Perry (Manager). Seated: FD Pelling, Wm Perry, AE D’Arcy, EMD Whatman (Capt), S Stewart, CW Perry, JH Beard. As with most Unions the Wairarapa Union has witnessed changing fortunes throughout its history, clubs have come and gone, new talent would shine and fade. Without a doubt the Wairarapa Unions brightest moments were 1927 through to 1930 when it won the Ranfurly Shield on two separate occasions, first in 1927, successfully defending it twice before losing it to Manawhenua (16 points to 18), the second time in 1928, successfully defending it eight times before losing it to Southland (16 points to 19). During this period the Wairarapa Union had no less than 9 players representing in the New Zealand team, heady days indeed. Wairarapa has held the Shield on one other occasion, that was in 1950 when they took it from Canterbury in Christchurch 3 points to nil, only to loose it to South Canterbury in the very first defence of 1951, going down 14 points to 17. Sitting: J Geary, A Blake (Capt), B Couch (Vice-Capt), B Desmond, N Desmond. Front row: M Garrity, A Corlett, R Lyster. The Bush Union was formed following a meeting held on the 6th April 1890 at Mr Cewe’s Hotel in Pahiatua, whereby a motion tabled by Mr Perry and seconded by Mr Howell instructed the Secretary communicate with the Eketahuna, Woodville, Dannivirke and Alfredton Clubs with a view to the establishment of a Bush Rugby Union. However it was not until the appropriate fee was paid to the NZRFU could the new union be affiliated to the NZRFU, the Bush Union paid the one pound fee in 1893. It was first proposed to call the Bush Union “Seventy Mile Bush Union”, but as the Dannevirke Club decided to stay out of the new Union, preferring to remain with the Hawke’s Bay Union, the title “Bush Union” was adopted. The Union saw success in the Bebbington Shield, a competition contested by the Bush, Horowhenua, Southern Hawke’s Bay, Rangitikei and Orewa Downs regions. Although the Bush was one of the smallest Unions it did produce one All Black, Athol Mahoney from the Konini Club, who represented in 1929 and then again in 1934 to 1936. 1970 marked the end of the Bush as a separate Union; however it was to play one more match. In 1979 as part of the Carterton Club Centennial celebrations, a match between Wairarapa and Bush was staged, all players to have represented their Unions. Bush players came from all over the lower North Island, when offered travelling expenses each player declined, echoing the spirit of all those who played before them “We’ve had the honour of playing for the Bush”. The 1971 season saw the merger of the Wairarapa and Bush Unions, under the leadership of Mr John Galvin Esq., President of the new Union, Wairarapa-Bush saw little success on the field immediately which left some wondering if the merger was such a good idea after all. The 1976 season saw a shake up in the national domestic rugby scene with the creation of a new national provincial competition, the NPC. The new competition was split into two divisions, Wairarapa-Bush being placed into the 2nd Division; however this was not to last long, in 1981 Wairarapa-Bush, under the guidance of Sir Brian Lochore, won promotion to the NPC 1st division. The Bush competed successfully at this level for a number of years, before slipping down the NPC ladder ending up in the 3rd Division, created from another reorganisation of the NPC in 1985. But as with everything fortunes wax and wane, and recently Wairarapa-Bush has enjoyed remarkable success, winning the NPC 3rd Division final of 2005. Another shake up of the provincial scene in 2006 saw the NPC 2nd and 3rd Divisions merged into the new “Heartland Competition”, with Wairarapa-Bush winning the inaugural Meads Cup in 2006, beating Wanganui 16 points to 14.